Magnum Logistics approached American Services early in 2014 seeking a solution for their Heavy Wood Waste produced from one of their warehousing facilities in Fargo, ND. Working together with American Services we were able to provide Magnum Logistics with an Auger Compactor solution that would best fit their needs. This application required a custom through-the-wall enclosure to accommodate the largest size of pallets that they would need to process. 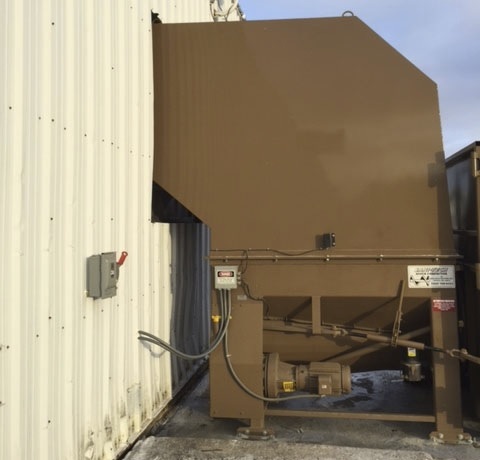 A large through-the-wall enclosure was suggested for this Distribution Center Compactor with a shelf for feeding with a forklift directly into the Sani-Tech Systems Model ST2054/40 which was located outside the wall. To add ease of operation for the fork lift drivers feeding the Sani-Tech Auger Compactor, the system was designed with our Photo-Eye Start system enabling hands off operation of the system. When the Pallet Waste is fed into the chute, the Photo-Eye Start will automatically start the Auger Compactor run cycle to process the waste. There is also a remotely mounted control panel inside the facility, next to the enclosure opening, for manual operation. Sani-Tech Systems ST2054/40 Auger Compactor installed by American Services in New Hope, Minnesota.